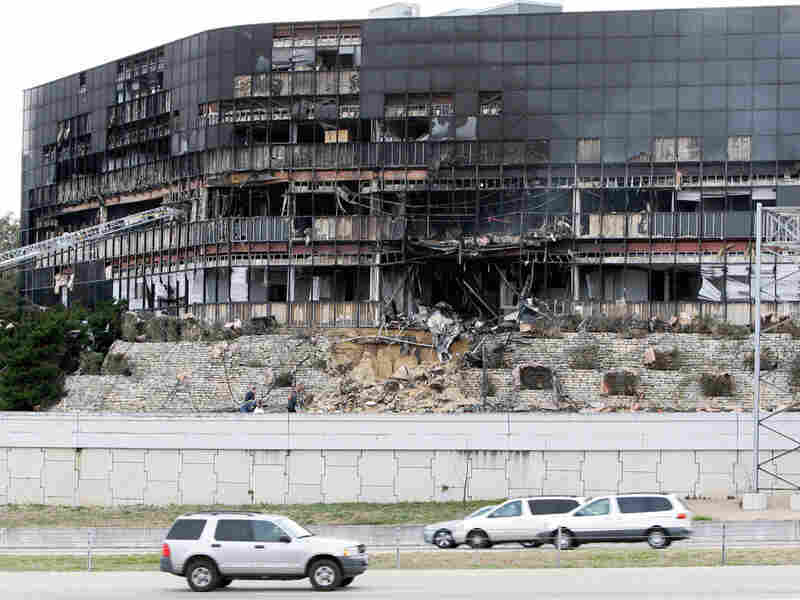 Hostility Against Federal Workers Troubles Officials A House panel this week examines the safety of government workers in the wake of the latest attacks on government buildings. The agency responsible for protecting federal offices says it has worked to improve training, but other factors — including an angry political climate — concern authorities. In February, a man flew his small plane into an Austin, Texas, building that housed several IRS employees. Three attacks on U.S. government employees this year, along with an upsurge in anti-government hate groups, have officials in Washington concerned about the safety of federal workers. While the agency responsible for protecting federal offices says it has worked to improve training, other factors — including an angry political climate — trouble authorities. The images from Austin, Texas, last month were frightening and familiar — thick black smoke pouring out of an office building housing the Internal Revenue Service that had been attacked by a man in an airplane. Agent Andrew Jacobson was inside the office. He thought a bomb had gone off. "There were two explosions: One with the initial impact of the plane against the building, then a second explosion when the fuel tanks went up. There was a wave of heat that hit, and then the ceiling tiles fell in on me, and then black smoke started pouring through the ceiling tiles [that] had been knocked out," Jacobson says. "The lights went out, and from that point it was pretty chaotic." The attack killed IRS employee Vernon Hunter, a 27-year veteran of the agency, as well as the pilot, a man said to have had a beef over taxes. A few weeks later, another man with an apparent beef against the government opened fire outside an entrance to the Pentagon, wounding two Pentagon guards before being killed. In January, a gunman possibly upset about a reduction in his Social Security benefits killed a U.S. courthouse security guard and injured a deputy marshal in Las Vegas. The attacks were all random, the attackers clearly disturbed. But they point to a troubling trend, says Mark Potok of the Southern Poverty Law Center. "There is a real upsurge in anger and threats directed at the IRS and other government agencies. As a matter of fact, there have been so many threats directed at judicial officials that, in fact, the U.S. Marshals Service opened a special clearinghouse to keep track of them," Potok says. Potok directs the center's intelligence unit, which tracks hate groups. The center reported this month that 2009 saw a dramatic surge in the number of such extremist groups. "We've seen in particular a huge growth in the so-called patriot movement that includes militias out there," Potok says. "And I think that some of the violence that we've seen, such as the Pentagon shooter and the IRS, are at least in some way a reflection of that rage." Potok says there are now more than 500 patriot and militia groups active in the U.S., more than triple the number in 2008. At a congressional hearing Wednesday, Virginia Democrat Gerald Connolly blasted politicians who empathized with the February IRS attacker. "Incredibly, some political figures offered a tacit defense of that terrorist attack," Connolly says. "One such individual was recorded saying, 'I think, if we'd abolished the IRS back when I first advocated it, he wouldn't have a target for his airplane.' "
That individual was Rep. Steve King (R-IA), who was not at the hearing. Contacted by NPR, his office sent a transcript of a newspaper interview in which King said acts of violence have no place in our society. King went on, "When someone finds themselves in this position of extreme frustration with the IRS, which I do understand, they should do what I did and get involved in the process." Meanwhile, the IRS says it has reviewed security in its offices, and the Federal Protective Service, which oversees guards at thousands of government facilities, says it has improved its training procedures. In Austin, the IRS has moved into new offices. Jacobson says he does not worry about another attack. "We can't let that stop us from doing our jobs," he says. "If anything, I think this has everyone a little bit more resolute."